Like Reese's Peanut Butter Cups, sofabeds put two wonderful things into one even awesomer package. People like sitting, and people like sleeping—it's the perfect combo. So how could a sofabed possibly ever be improved? 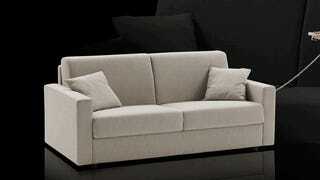 With an electric mechanism that automatically unfolds and retracts the mattress, with the cushions still attached.